Why did I read this? Because I have been reading this series from both ends, the beginning and the newest. And this is the very newest in the series. Longmire is on his own as he goes into Mexico to retrieve his daughter Cady from a despicable narcolord who has kidnapped her. He and his men upset Longmire’s small town in Wyoming and caused grievous injury to his family. Longmire has assembled a rag tag team to assist in his rescue attempt. Craig Johnson incorporates the indigenous population and their culture into the story. Everything you would expect in a Longmire story. What is with the title of the review? I have read several of the books at the beginning of the series and the newest two books. There are evidently somethings I have missed in the interim. A severed arm is found in the White House’s Rose Garden, with something clutched in its hand another arm is found at Camp David with something clutched in its hand. The President decides that he needs the help of Beecher from the National Archives and the Culpepper Ring to defeat some people who mean to bring harm to the Presidency and perhaps the nation. In the course of the investigation Beecher discovers some disquieting things about his family, his friends, his hometown, and his government. A great mix of the beginning of the country, recent history and current events. Beecher and his pals are geniuses in different areas of history and other areas that come in handy during the investigation and conflict. Did I enjoy it? Yes, I did it is an exciting combination of history, modern adventure and learning about family and friends. What is with the title of the review? Howard Zinn said ” Patriotism is not obedience to the government. Patriotism is obedience to the principles for which the government is supposed to stand.” Some of that comes into play here. 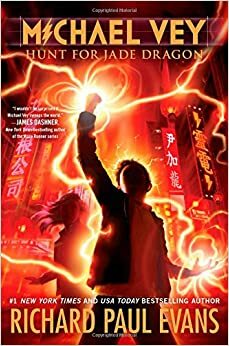 Michael Vey and the Electroclan are recovering after the Battle of the Ampere when they are sent to Taiwan to rescue Jade Dragon. She is an autistic savant who has come up with a formula that the Elgen covet so they can make more electric children. Before they undertake the mission they are reunited with their families and have some r&r at a ranch somewhere in the Southwest. They recruit a new member to the Electroclan who had been a enemy previously to help them rescue Jade Dragon. They are captured and escape learning new powers and new languages. They rescue Jade Dragon and get some bad news, which will start the next book. Did I enjoy it? Yes, Evans has crafted another exciting with a theme of family at its core. Each of the Electroclan is tight with family in some shape. What is with the title of the review? A theme that has run through all of the Michael Vey books is family. Family is not just blood. Sister Sledge had a hit with the song We Are Family in 1979. Michael Vey and the Electroclan have successfully rescued Michael’s mother and some of the other electric children from a Elgen camp in Peru. Michael escapes into the jungle where he meets up with another of the electric children and a member of a group that opposes the Elgen. The action is non stop and moving. Michael and the Electroclan are able to take a measure of revenge against the Elgen for the loss of one of their own. Did I enjoy it? Yes it was a exciting read and an emotional roller coaster that caused me to get choked up a few times. What is with the title of the review? At one point Michael Vey remembers something his mother said, “All evil needs to triumph is for good people to do nothing.” This is a quote that I have seen attributed to Dietrich Bonhoeffer.